Download DA Form 8000, also known as an ASAP Triage Instrument. 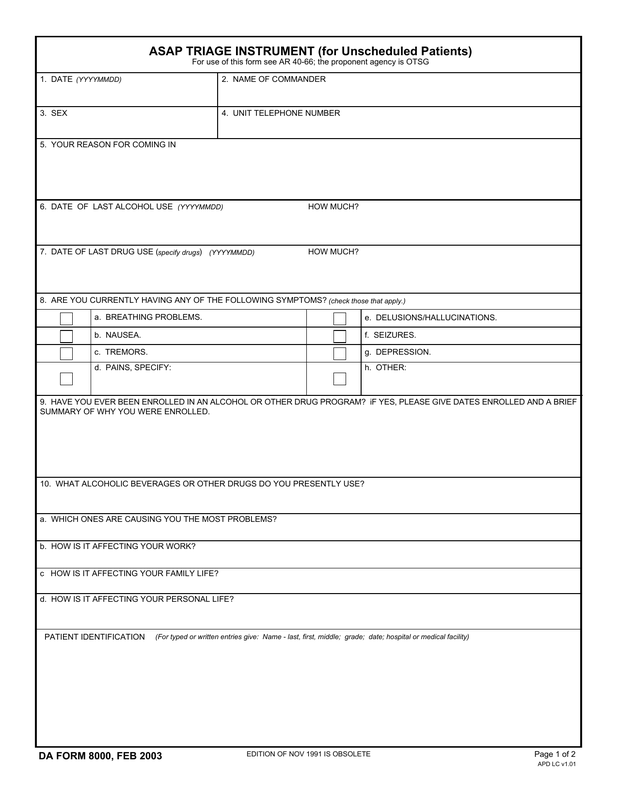 This form is used to gather information with regard to personnel who may be struggling with addiction. The same would apply for personnel, soldiers or otherwise, who may be struggling as well with forms of mental illness or who may be contemplating suicide. It’s simply an emergency information tool for therapists in the military to assist in proper treatment for emotional health. c. How Is It Affecting Your Family Life? 11. Do You Presently Need To Continue To Drink Or Take Other Drugs So You Can Avoid Having Shakes, Depression Or Other Uncomfortable Feelings?